The car was totaled and being parted out. Please note again this is for only ONE battery module not all of them as in the picture. 24V 200Ah 384 Cells 4.5kwh 18650. You will get your module with a picture of the voltage take at the terminals. Some of the battery the top or bottom plastic covers are damaged but that doesnt take away from the functionality of the battery. The item "Tesla Model S Battery Module Node 24V 200Ah 4.5kWh 384 Panasonic 18650 S60 S70" is in sale since Friday, July 27, 2018. 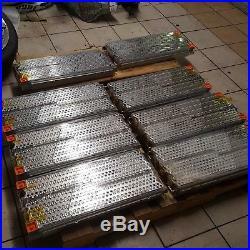 This item is in the category "eBay Motors\Parts & Accessories\Car & Truck Parts\Electric Vehicle Parts\Electric Vehicle Batteries". The seller is "schiraz01" and is located in Brentwood, Tennessee. This item can be shipped to United States.